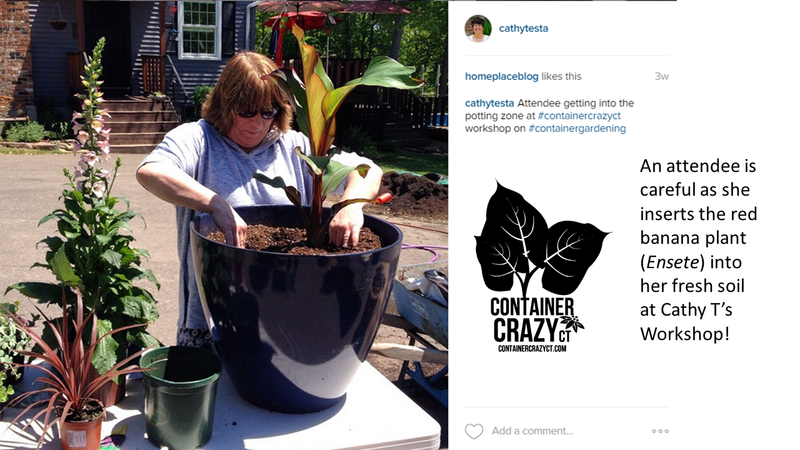 During my container garden workshops, I’ve seen some things attendees will do as they start to assemble their container gardens and pots. It is not intentional on their part. They are so excited to get started selecting plants and putting them into their container gardens after my talk that they will move quickly and do some little things I try to catch them on before they continue. It reminds me of things they should not be doing because it can harm the plants or make the container look unbalanced. So, I decided to create this list – and will share it at my future workshops too. Here are the things you should not do as you put together your container gardens and patio pots. #1) Do not fill the pot to the rim with soil mix. Filling the pot with soil mix up to the rim of the container will cause the soil to spill out when watering, or the water might roll off the top somewhat. There should be about a 2-3” space from the top of rim to the top of soil line. If the water is not flowing well into the soil, it will not permeate down to reach the plants’ roots, plus it looks a little odd to have the plants sitting at the very top of the pot. Aesthetically, they are better placed a few inches down. Additionally, the base of the plants are somewhat protected if they are not exposed at the very top – reducing things like toppling over due to wind, etc. #2) Do not press down hard on the soil after you have inserted the plants into the container. Out of habit or belief the plants should be pressed firmly into the soil, I’ve seen attendees do this at my workshops. They will push down on the soil, sometimes very hard, after they inserted the plant into the pot. This is not a good idea because you are compressing the soil which may reduce the air pockets required for oxygen in the soil to be used by the plant’s roots. Unless the plant is very top heavy or was root bound (thus a little weighty on the bottom), avoid pressing down hard on the top of the soil after planting. If you need to press, do so lightly and gently. You don’t want to smash the roots or crush the base of the plant by pushing down hard onto the soil. #3) Do not grab the plant by the leaves and tug it from the starter pot. When you take the plant out of its growing pot to put it into your container garden, use one hand to place over the soil at the stem base, and the other hand to turn it over carefully so it slides out of the growing pot. Try to not pull or tug at the plant by its leaves or stems. If the plant has been growing in the pot for a while, it may not slide out easily. Squeeze the growing pot a little to loosen it up or roll it gently on a table. Conversely, if the plant has been recently potted up in its growing pot, the soil may fall away from the root ball as you take it out because the roots have not grown into the new soil yet. Be careful to not damage the plant or its root system as you remove it to put in your container garden. If the plant is extremely root bound, and it is impossible to remove it from the starter pot, cut the pot at the bottom about 1” from the base to remove the closed end of the pot, and then push the plant’s root ball and soil through to remove it. A Hori-Hori garden knife or a razor knife works well for the cut. 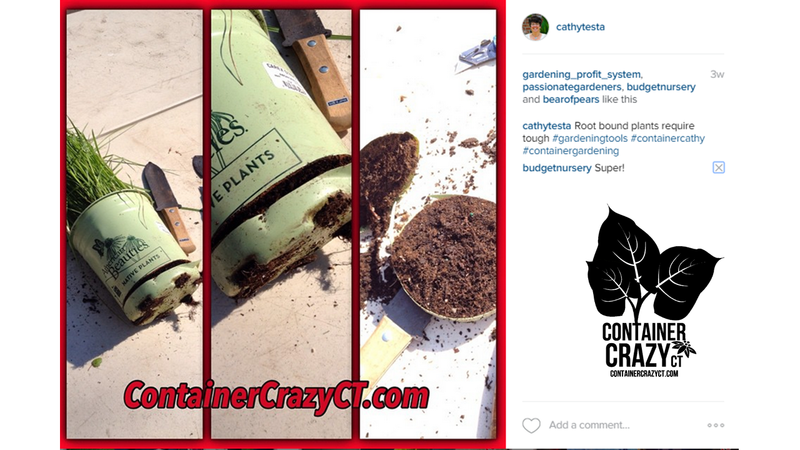 #4) Do not put a plant with circling roots directly into the container garden. When roots are tightly circling around the root ball, this is referred to as girdling. The plant has been in the growing pot for a while, and the roots have nowhere to go except to encircle the root ball as it hits the sides of the inner pot. Do not put plants with tightly bound girdled roots directly into your container garden without first detangling the roots by hand if possible. If the roots are so tightly bound (really tight like they are hard to pull away or tease apart), you may use a clean sharp knife or pruners to cut them apart by cutting here and there. The roots need to be released, so to speak, to move freely and easily into the new fresh soil of your container garden. #5) Do not put the plants into bone dry potting mix. When you container garden, you should lightly moisten the soil mix before you put your plants into your container garden or patio pot. Otherwise, the moisture in the starter pot will be drawn into the dry soil in the container garden thus taking it away from the plant’s roots. If the soil mix is dry, use your watering wand to moisten it – the key is to moisten, though – not to waterlog the soil, or turn it into mush. Just wet it a bit and then take your hands and mix it around lightly so the moisture is distributed. This will help the plants to adjust easily from their growing pot to their new beautiful soil environment. #6) Do not put dry plants into the container garden without giving it a drink first. It is a good habit to water your plants in their growing pots before putting them into your container garden or patio pots – preferably the night before, or the morning of, or at least a ½ to 1 hour before you assemble your container garden if its soil is “bone dry” in the growing pot. Another tip – be sure to water everything in after you finished assembling your container garden – but the key is, again – don’t over water. You want everything to settle into its new environment in a well-balanced slightly moist but not waterlogged state. Do not walk away before doing this final step. And direct the water at the soil line, not on the foliage if possible, with your watering wand or watering can. #7) Do not put your plants in full harsh sun right away. If your plants were grown in a greenhouse and not transitioned to the outdoors yet, you need to “harden-off” your plants. This term means to move the plants, or better yet, ‘transition’ the plants into the great outdoor sunlight carefully – otherwise, they may burn. Be sure to harden them off first if grown in a greenhouse by placing them in shade to part shade for a day or two. In many cases, hardening off is not required if the plants you purchased were already outside at the nursery. You will know if your plants were not hardened off first when you see the leaves turn white if you put them directly into sun – as is the case with houseplants or plants you overwintered inside, they must be hardened off first as well when you move them outside. And finally, another tip – when I plant my container gardens, I tend to make pockets in the soil mix to insert each plant. In other words, I don’t fill the pot half way with soil (like I’ve seen done), place or position all the plants, and then backfill around the roots. I personally believe the pocket method makes the plants more comfortable and allows the roots to make easy contact with the new soil in the container. But that’s being a little picky perhaps – all I know is this method has worked for me for years. 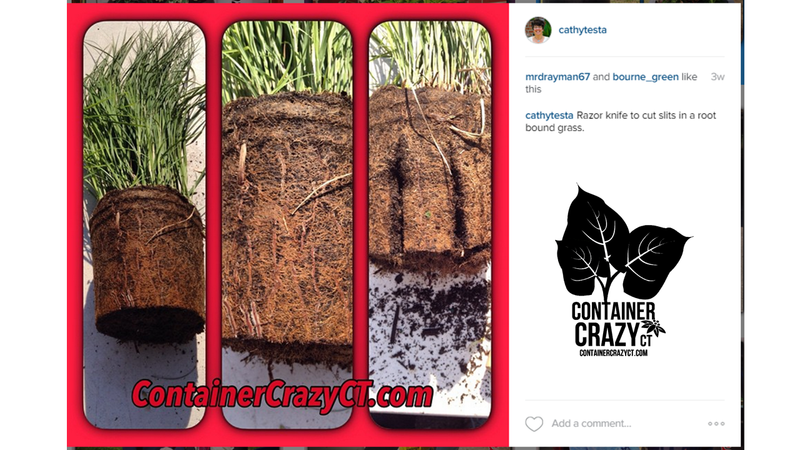 To see photos of the above “Don’t Do’s”, please visit my Instagram feed or Pinterest boards where I show examples, or better yet, take one of my workshops in the future to learn and see hands-on more tips by ContainerCrazyCT. Reference don’t #4: rootbound plants: I use a serrated bread knife to slice off a narrow “pancake” at the bottom and them use the knife to run lightly in cross hatch around the roots, pulling a big one if I need to. Great ideas. Leaving room at the top for watering is a must. I use pine bark soil conditioner as a final mulch over the soil in my pots, so room must be left for the water to bead until it is absorbed. Great list Cathy! Thanks for sharing! Thank you HomePlaceBlogger! 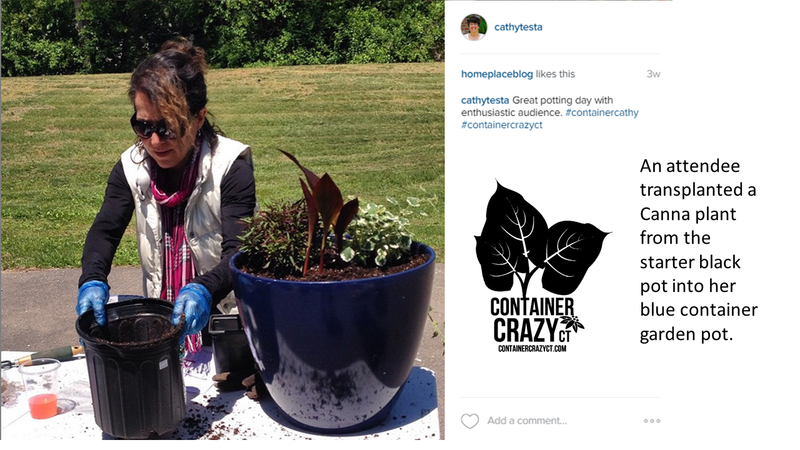 Witnessing what people do with the container planters helps me to teach and advise – and everyone definitely appreciates the Cathy T tips. 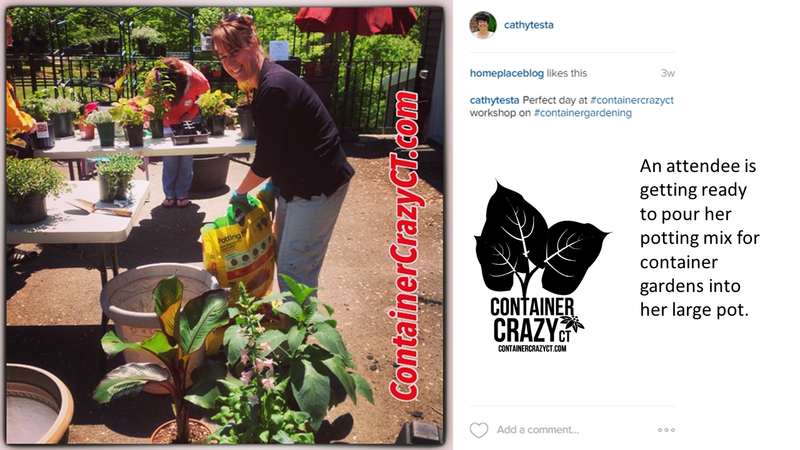 I’m turning people into Container Gardening Addicts!! LOL. Love the tips you gave. Can I transplant the perennials from the container to my garden in the fall? Yes Judy – Definitely. I do this all the time here in CT Zone 6 and have no issues. They say before the ground gets cold or frost hits – but I’ve done it all different times in the fall season, and every time, they return. Great advice there Cathy. I’d add ‘Don’t buy the plants unless you can pot up your container within a day or two’, as it’s so easy to buy little plants, with the best of intentions, that you then leave too long. I do it way too often!